An emotional Tim Nolan of Murrulla Stud struggled to find the right words to describe just what it meant to be the new record holder of a Classic yearling. Lot 609 – a Brazen Beau x Pouter colt from Murrulla – today became the highest-priced horse ever sold at an Inglis Classic Sale, which this year is in its 50th edition. The yearling (pictured) sold to Bruce Perry Bloodstock for $550,000, eclipsing the old record of $480,000, which was set last year. Murrulla sold Brazen Beau at the Classic Sale in 2013 and bought Pouter for clients Warwick and Anne Doughty, in foal to him at the final Australian Broodmare and Weanling Sale at Newmarket in 2017. 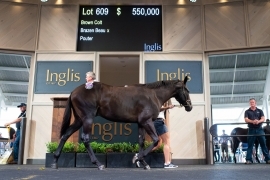 “For a little farm like Murrulla, to hold a record with a company like Inglis with such history and who have sold so many horses at this sale over so many years, I couldn’t believe it to be perfectly honest,’’ Nolan said. Perry was thrilled to be taking the colt home. “I thought he was the pick of the colts. We loved him,’’ Perry said. On a day where four of the overall top five lots were sold, it was Darley stallion Brazen Beau who found himself siring the top two lots and ending the sale as leading sire by average ($247,857). The second-top buy of the day was lot 666, a Brazen Beau x Rose of Hallowell colt offered by Aquis Farm, which Laceby Lodge secured for $480,000. Aquis sold 12 of their 14 offerings in Book 1, leaving Chief Executive Shane McGrath delighted. “It was a heck of a sale for the team,’’ McGrath said. Brazen Beau now holds the record of siring the top three Classic lots ever sold, something Godolphin Australia’s Managing Director Vin Cox is proud of. “It’s a fantastic record and those who bought them last year are reaping the rewards with the likes of Stakes performers Accession and First Dawn, as well as Pretty Brazen,’’ Cox said. Today saw the conclusion of Book 1 of the Classic Sale, with the clearance rate sitting at 81% and an average of $76,701. Inglis Managing Director Mark Webster was satisfied with the overall Book 1 results – which saw 27 vendors enjoy a 100% clearance rate - but stressed he hoped to see the overall clearance rate increase in coming days through private sales. “Although the clearance through the ring has ended at a respectable 81%, we still expect that to rise and will be doing everything in our power to help vendors and breeders facilitate trade in coming days,’’ Webster said. “I’d like to congratulate Tim and Celie Nolan of Murrulla on selling not only this sale’s top lot but the highest-priced yearling ever at Classic. “I’d also like to acknowledge Newgate Farm for being leading vendor by aggregate for the second consecutive year at Classic, and Wentworth Stud as leading vendor by average for three or more sold. To view today’s Inglis TV story on the 23-year-old couple Jack Buckley and Beth Grant running Parrakoola Park, CLICK HERE. To view our Book 1 review Facebook Live show, CLICK HERE. To enquire about a Passed In lot from the sale, contact Matt Scown on 0481 989 661. The inaugural Highway Session (Classic Book 2) begins at Riverside at 10am Thursday. Tomorrow there is a metropolitan race day at Warwick Farm featuring two Inglis Highway Handicaps – one for Country-trained horses and one for Provincial-trained horses. If the winner of either Highway race is an eligible Inglis graduate (paid up for the current or a former Inglis Race Series), the winning trainer will receive a $50,000 credit voucher to spend at the Highway Session on Thursday. Inspections for the 205 catalogued Highway Session horses are underway and will continue tomorrow and Thursday. For those unable to attend on Thursday, online bidding will again be available at inglis.com.au, and the sale will be broadcast live on the Inglis website and Facebook page. To view all the statistics from Classic Book 1, CLICK HERE.